Start your spring right with FREE naturopathic and lifestyle medicine! 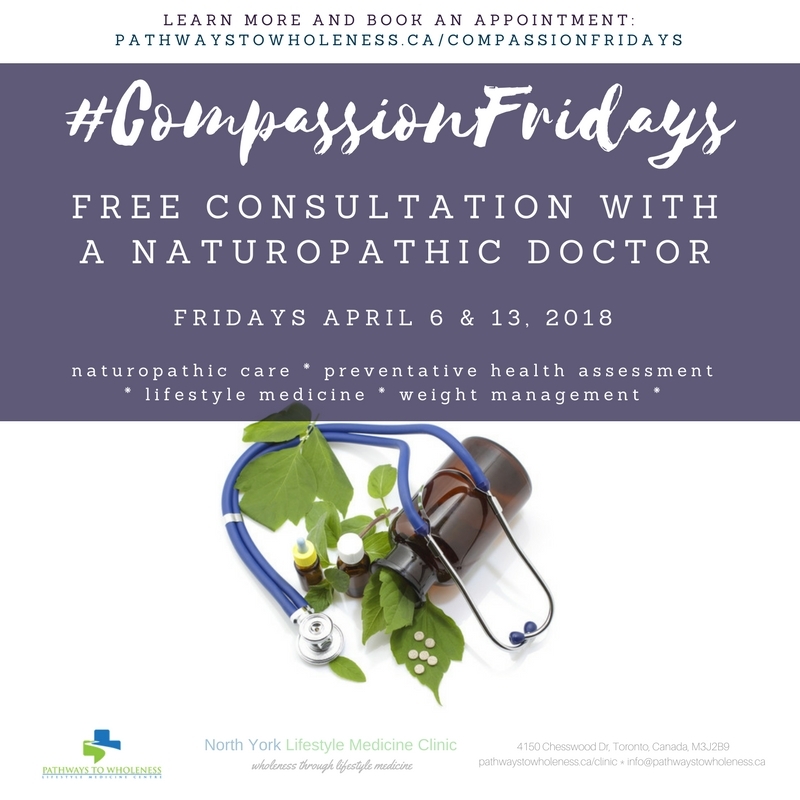 #CompassionFridays is a service of Pathways to Wholeness' North York Lifestyle Medicine Clinic offering FREE initial consultations and assessments for new patients. WHY #CompassionFridays? Because one of our key commitments is to make naturopathic and lifestyle medicine accessible to as many as possible. Wholeness should be for all, not just those with means. LEARN MORE ABOUT THE NORTH YORK LIFESTYLE MEDICINE CLINIC HERE. Naturopathic care for common illnesses and conditions. We treat the full range of chronic conditions: obesity, diabetes, heart disease, cancer, asthma, eczema and more using naturopathic and lifestyle medicine. Whether you have a health concern or not, take this comprehensive lifestyle assessment to learn whether you're living an optimal healthy lifestyle . Learn more about the assessment here. 1. Submit an intake form from the options below. 2. Book an appointment here. Make sure you select Compassion Fridays. Important: #CompassionFridays are for NEW patients. If you are already a patient of the North York Lifestyle Medicine Clinic and want to book a follow-up appointment, please book here. Have a question about #CompassionFridays? Thank you for your question about #CompassionFridays!